The Super Eagles of Nigeria will on Saturday afternoo battle Libya for the African Cup of Nations qualifier, and the team lineup have been previewed. Gernot Rohr is set to hand Arsenal forward Alex Iwobi the No.10 role the Super Eagles’ starting line-up when they face Libya in a crunch 2019 Africa Cup Of Nations qualifier on Saturday in the absence of captain Mikel Obi, Completesportsnigeria.com reports. Mikel was excluded from the game as he is still battling to regain full fitness after featuring for Nigeria at the 2018 FIFA World Cup in Russia. Rohr could also hand Isaac Success his first start in his second appearance for the Super Eagles. The Watford star made his debut in a 1-1 draw against Senegal in an international friendly played in London in 2016. 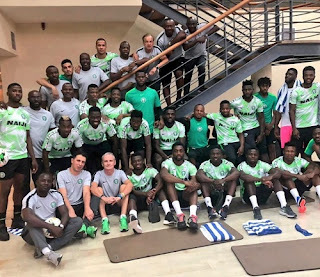 The team was split into two groups comprising the possible and the probables,Completesportsnigeria.com on ground in Uyo, gathered from the closed door training session which was held at the Akwa Ibom international Stadium. Wilfred Ndidi and Oghenekaro Etebo were the two holding midfielders while Iwobi played behind Isaac Success who led the lines for the team in green. Ikechukwu Ezenwa was in goal for the group in red bib, and he had Ola Aina and Bryan Idowu as full-backs while Kenneth Omeruo and Semi Ajayi were the centre half pairings. In midfield, John Ogu, Chidozie Awaziem and Ogenyi Onazi played as midfielders with the trident of Kelechi Iheanacho,, Moses Simon and Henry Onyekuru in attack. Odion Ighalo replaced Success during the interval in the team in green with the Watford star moving to joi n the team in red.